Drove all the way from Appalachia,VA to purchase her new 2014 Soul from Micah Cullop. Thank you for business!!! Bought a 2011 Toyota Camry from our Used Car Super Center.. Sold by Kevin Williams.. Thank you for your business!! Bought her first car from the only female dealer in the Mountain Empire. Congratulations on the purchase of your KIA Soul and thank you so much for your business. Bought their new car from Kia of Johnson City sold by Steve Fry. Thank you for your business!! Drove All the way from Michigan to buy her gorgeous cherry red Kia Soul!! Thank You for your business! Purchased a Chevy Van from Kevin Williams. Thank you for your business! Bought a 2011 KIA Optima from Brad Manis. Thank you very much for your business and enjoy your awesome ride!! Bought a 2014 Kia Soul from Brad Manis.. Thank you for your business!! Enjoy your new ride! Drove all the way from saltville,VA to buy her new 2014 optima from Micha Cullop! Thank you for your business!! With their 3 adorable kids bought a new 2014 KIA Soul from Dylan Holdren.. Thank you for your business and enjoy your new car!! Bought a 2014 Kia Sorento from Brad Manis. Thank you for your business! Bought a new sorento from Micha Cullop, thank you for your business and enjoy your new car! From Butler,TN drove down to buy from Kia of Johnson City to buy a 2013 Kia Rio from Gary Hensley. Thank you for your business and enjoy your new car!! From Butler,tn drove down to by their new 2013 optima hybrid from Kevin Williams. Thank you for your business!! From Kingsport bought a 2012 KIA Soul for his daughter going to college this fall from Gary Hensley. Thank you for your business! You made a great choice for your daughter: dependability, safety, and style is KIA"s middle name! Purchased a new 2014 Sorento from Kevin Williams. Enjoy your new SUV and thank you for your business!! From Abingdon, VA with her son bought a new 2014 KIA Optima from Gary Hensley.. Thank you for your business!! With her precious daughter Paige bought the safest and sexiest sedan ever built! !-the new Kia optima!! Thank you for friendship and business!! From Kingsport, TN purchased a 2005 Kia Optima from Steve Fry. Thank you for your business!! Bought a car on his birthday from Dylan Holdren! Happy Birthday and Thank you for your business!! What a great experience I had a Kia of Johnson City. Great Sales Staff, Great Price. Thanks Again. Love My Optima. Salesman Brand Manis sold Wendy Anderson a new 2014 Kia Optima from Bristol, TN! Thank you for your business and enjoy your gorgeous sedan! Purchased a 2013 Kia Sportage from Dylan Holdren. Thank you very much for your business! Enjoy your new ride! Salesman Kevin Williams with new owners Mr. and Mrs. Davis from Bluff City, TN. Thank you for your business. Enjoy your new Sorento! We love our customers! Chucky just helped Shakara Crudup from Knoxville go home with her new 2014 Kia Soul! Thanks, Shakara! This is Katherine Cox from Elizabethton. Our salesman Ronnie Farmer just helped her take home a 2014 Soul. Thanks, Katherine! Thank you, Phillip, for your purchase of a 2014 Sorento with help from Chucky Harrison! Micah helped Jerry Keller from Johnson City take home a 2011 Sorento. Thanks, Jerry! More happy customers! The Wises from Nora, VA just bought a Sorento from Micah. Micah sold the lovely Ms. Medlin from Kingsport a 2014 Forte! Thank you for your business! From Surgoinsville, TN bought their new Optima from Micah. Thank you for your business! From Meadowview just bought a Sorento from Micah. Enjoy your new ride! Micah helped the Clarks from Roan Mountain go home with their new Soul! We love our customers! 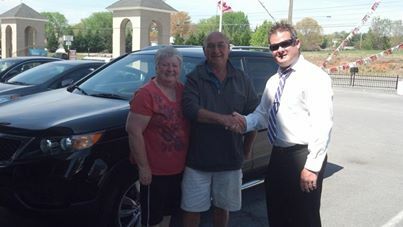 Thanks, Mr. and Mrs. Foster, from Chuckey, TN for buying your new 2009 Sorento from Steve Frye. Enjoy your new ride, Patrick and Anna. They bought a new 2014 Forte from Steve Frye. Bought a 2015 Kia Sorento from Kevin Williams. Thank you for your business, and enjoy your new ride. Bought a 2014 Kia Rio from Kevin Williams this weekend. Thank you for your business! Bought a 2011 Kia Soul from Ronnie Farmer. Thank you for your business, and enjoy your new ride! Drove all the way from Mountain City, TN to buy his Kia from Kia of Johnson City: a new 2014 Kia Soul purchased from Chuckey Harrison! Congratulations and thank you for your business! Congratulations on your new 2015 Kia Sorento! Ronnie Farmer was glad to help you with your purchase. Thank you for your business! Bought a 2006 Kia Optima from Chuckey Harrison this weekend. Congratulations and thank you for your business! Congratulations to Jeffery Vannoy on his new 2014 Kia Forte! We thank you very much for your business! Enjoy your new ride sold by Ronnie Farmer! We love our customers! Thanks, Joy Smith! We hope you love your new Optima! Gary just helped Mrs. Quinn from Bristol, TN go home with her new Forte Koup! From Jonesborough is going to have a great time driving around in her new 2014 Soul. Thanks, Carrie! The Garst family from Limestone looks happy to be going home in their new 2014 Optima! We love our customers! Another great day with Brad Manis, Judith Dunlap just got herself a 2009 Sportage! Brad Manis helped Monica Hart from Gray go home with a new 2014 Soul! The lovely Mr. and Mrs. Williams bought their 2014 Cadenza from their son Kevin Williams. Thanks! Enjoy your new ride, Tonya! Thanks you, Diedre Burgess, for your business! She drove all the way from Mountain City to buy at the only female-owned dealership in the Mountain Empire! Enjoy your sporty ride! Bought a 2014 Kia Optima from Ronnie Farmer. Thank you for your business!! Drove all the way from Palm Beach Gardens, FL to trade with us! He bought a new 2014 Kia Forte! Sir, thank you for your business!!! Mr. Grindstaff and salesman Micah with new customers from Louisville, TN bought their new car from Kia of Johnson City because of great people, great selection and lowest prices! Thank you, Mr. and Mrs. Russell for your business!! Bought her first car from Kia of Johnson City! Thank you for trusting us with your first car purchase, and we appreciate your business! From Butler, TN, bought a 2013 Kia Sorento! Congratulations, and thank you for your business! The McKnight family drove all the way from Wise, VA to buy a Kia Optima Hybrid because of our best price, best selection no pressure atmosphere. We appreciate your business very much! Drove all the way from Breaks, VA to buy his new 2014 Kia Sorento SXL. Thank you, sir, for your business and trusting us with your car needs! Thanks, Sheryl and Gary Dye from Bristol, Tennessee for buying a new 2014 Optima! Just bought his SECOND Optima! Hope you enjoy the sexiest sedan ever built! Micah just sold the Manchas from Greenville a Kia Sedona. Thank you for your business! We can make everyone happy, even if you don't buy a Kia! Micah helped Mr. Williams take home a Chevy Trailblazer. Thanks, Mr. Williams! We love our customers! Thanks, Ms. Jones, for doing business we us. We hope you enjoy your new Rio! Thank you, Hare family, for your business! We hope you enjoy your Nissan Titan! Hope the Mcamis family is happy with their new 2014 Kia Sedona! From Bluff City just took home a Kia Soul! We hope you love it as much as we do! We love our customers! Jason Vanhoy from Abington, Virginia just took home a new 2014 Kia Soul. Thanks, Jason! Thank you, Mr. and Mrs. Thurston from Bristol, VA for buying a new Kia Sorento! The Beliceks bought a new 2014 Kia Sorento! Thank you for your business! We love our customers! Michael Armstrong bought a 2008 Sorento. Hope you enjoy it, Michael! Thank you, Darrell and Leisha Bennett, for getting your 2012 Hyundai Accent here at Kia of Johnson City! Congratulations to Mr. Grayson from Chucky, TN on his new Kia Forte! We appreciate your business with salesman Micha. Bought a 2011 Kia Soul from Ronnie Farmer. Thank you for your business and enjoy your new ride!